AUTO BLACK can take a good 30 seconds. SHUTTER SPEED controls the electronic shutter and determines the effective exposure time for each frame. 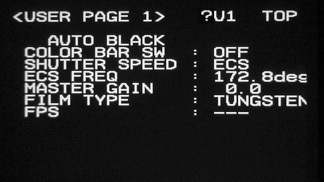 ECS is used to select other shutter speeds defined by ECS FREQ setting below. ECS FREQ are user defined shutter speeds. Pictured here is the European and Australian standard setting of 172.8 degrees. The available range is from 1 to 360 degrees. MASTER GAIN changes the amplification of the signal. More gain means more exposure but also more video noise. DAYLIGHT is used with daylight or 5600 Kelvin lighting, although some cinematographers prefer to use an 85 filter in front of or behind the lens. SHUTTER from page P12 is sometimes added to the list. SHUTTER OFF is sometimes called a "360 degree" shutter. SHUTTER OFF increases the exposure by 1 stop relative to 180 degrees, and also increases motion blur. There is no real film equivalent to SHUTTER OFF.